Historically, Hyderabad has a long history of reconstructing the legendary heritage structures in Hyderabad city and is making plans for the future generations to be developed and implemented. GHMC the last decade apart from the slow running of Charminar pedesteriyan project undertaken intensive work on the four sides of the Old City, a special attraction of the Char Kaman cudibajar, murgicauk, Clocktower, julphikan come, through the restructuring of the flower markets mojanjahi The funds reserved for special assignments carried out in order to bring glory of GHMC.The reconstruction of the following heritage structures was taken seriously. 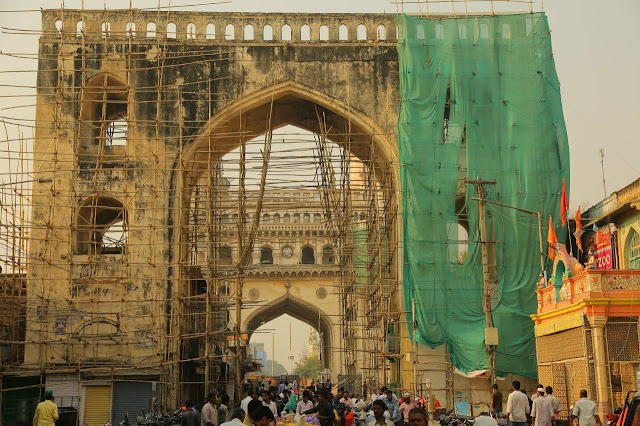 The Charminar Pedestrian project works to improve the neighborhood of Charminar, one of the international tourist destinations, is rapidly progressing. In October 2006, The Charminar project initiated by the previous government with Rs. 35.10 crore is being carried out as the state municipal minister KT Rama Rao is running the fast. Charminar reviewed the Federative project work and visited KTM in Charminar. Total Rs. The Charminar project costing Rs. 35.10 crore is Rs. Rs 12.28 crore is provided by the Government of India and Rs. 5.26 crore State Government and GHMC Rs. 17.55 crore is offered. Charminar Beauty, clean work, infrastructure, battery-carrying vehicles, etc. NTPC allocated 8,19 crore. As part of the Corporate Social Responsibility Scheme, these funds were allocated for the development of Charminar under the iconic project. Besides, the bazaars in Ladakh Bazaar were removed from the front of the gorge and remedied to create an eye-catching elevation, especially Hyderabad architectural style. The granite pavement works from Charminar to Gulzar House were completed except Sardar Mahal. Street skating works have been completed on the way to Madinah. Central lighting in the areas of Charminar will be carried out in full after the granite stone is removed. Heritage buildings on the way to Gulzar House are clearly visible to the tourists as the Flex Banners and the furious hoardings are eliminated. The next year, the Charminar Complex was built, in 1592, four karmans were built around Charminar. Char Kaman, Cali Kaman, Machilie Camaan, Sher Aa Batul Kamman, is a four-storey, 60-foot, 30-foot-wide Indo-Persian style. These four are very close to Charminar as a special attraction for the city of Hyderabad. Fascists, electric wires, signboards, invaders and occupations have lost their glory because of the severe neglect over the management of these four arms. The four of these plants were lost in the growth of the plants, the sound of the sound and the air pollution. The GHMC allocated 87 lakh rupees for the restoration of these chariots found to be a historical heritage. Four funds for plastering, repairs, and renovation of the charkhamans in the traditional way have been done with these funds. These hammers have already been repaired for the repairs, removing the faxes, removing the pickles, removing the shops on the char-coman and other activities. The GHMC officials are working to complete the renewal of the charter that began on October 14th until the end of April. Mahabub Chowk was built in the shape of a square in the vicinity of Nawab Asman Jah Bahadur Charminar, the chief minister of Hyderabad State from 1887 to 1894. The five storey clock tower in the center of the chowk was also built. The GHMCC granted Rs.60 lakhs for the renovation work of this clockwork in 1892, with four big clocks on Turkish architectiles in Ayla. This clock tower restoration work is going on immensely. Murgi Chowk, a 125 year old historian, has a unique character in the world. There is no bird found in the Murgi Chowk. Mantem is sold to chickens, ducks, and others that do not fall under the chicken and wildlife law. The Chief Secretary Arvind Kumar and GHMC Commissioner Dr.B.Jonathan Reddy have recently visited Murgi Chowk with Akbaruddin Owaisi and Pasha Khadri, legislators to restore this Murgi Chowk. However, the existing Murgi Chowkku repairs and reinforce the Rs. 5 crores. Murgi Chowk, which is currently in tune of Rs. 20 crores. The GHMC has requested the JNET Technical College to advise JNT technologies in this regard. The GHMC has removed sign boards that reveal the full name of the hoardings and banners in front of the heritage shops, and in front of the heritage shops. In this way, all the business, trade, shops and similar platelets are set up. M.Sc. The GHMC has taken up the renewal work with a 10 crore basic assessment. Chief Minister Arvind Kumar took up the reinstatement with the directions of State Municipal Minister KT Rama Rao. In 1935, Nizam Mir Osman Ali Khan built his second son, Nawab Moszza Bahadur. Built with 120 shops in the 1.77 acre area, the market was known as the PAN Bazaar until 1947. There are no untapped pan varieties. Eventually it became known for flowers, mutton, bakery, ice cream shops. It was built for the old basti and new battles. Like the high court, Osmania hospital, City College, the Mozzahjai market is architectural style. The state municipal minister KT Rama Rao directed the entire mosjamahi market to be fully restored in three months, with the complete formation of encroachments, illegal structures and banners. The chief consultant Arvind Kumar recently held a special meeting with traders, historic monuments and heritage conservation properties in the market. History lovers and urban residents are expressing their resentment because the 87-year-old Mojazhihi market, symbol of the city's historic heritage of Hyderabad, is being revived after the construction. Recently GHMC revived Gulzar Howe Fountain near Charminar. The Government of Telangana will be grateful to the redevelopment of the oldest heritage quarters of the city of Hyderabad over four hundred years, thanks to the state municipal minister KT Rama Rao and the Mayor of the city Bantu Rammohanan.